St. Louis A to Z: Grant's Farm, Gateway City, Gooey Butter Cake & Gus' Pretzels! - JP loves LIFE! St. Louis A to Z: Grant’s Farm, Gateway City, Gooey Butter Cake & Gus’ Pretzels! After F was such a no brainer for me on the city of St. Louis A to Z, I feel like I may not do justice to the letter G but hopefully this post will come together. It probably seems a bit odd that someone as Southern as me would feature Grant’s Farm in it, especially since it is named after that Grant — Ulysses S. Grant, former Civil War general and President of the United States. He founded the place in the 1850s and farmed a portion of the almost 300 acres. Now though the farm is thought more in terms of a great place for families to spend the day or for connections to the Busch family (yes the beer folks). 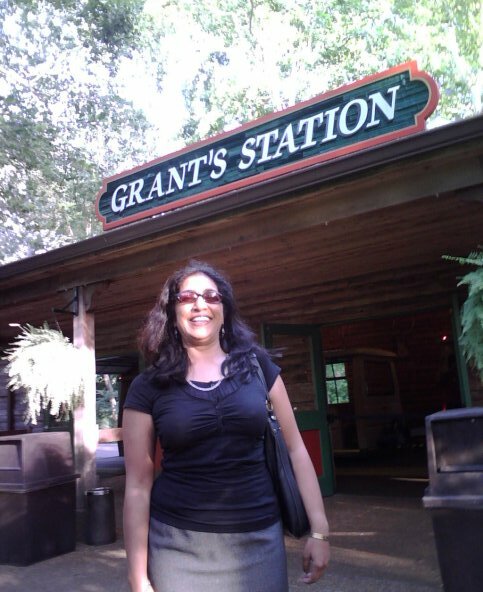 I went to Grant’s Farm a few years ago with my friend Ranjana who has since returned to India. Grant’s Farm is just south of town and is home to more than 900 animals representing more than 100 different species. According to the Grant’s Farm website, more than 24 million guests have visited this popular family attraction since it was opened it to the public in 1954 and it is ranked the seventh-best family attraction nationwide in the U.S. Family Travel Guide Zagat Survey. 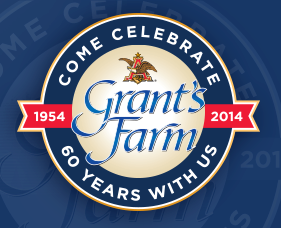 A few of my St. Louis blogging friends have written about their experiences on Grant’s Farm! Check out this post by Alyssa Holyfield Groeteke showing how her little one got to pet the Clydesdales, feed the goats, check out the elephants, ride the tram and more! Denise Bertacchi has a great post that covers some of those same areas as well as the bike trails, grabbing a bite to eat at Grant’s Farm and more. The park is celebrating 60 years so there are some special activities nos and then. If you are thinking this sounds like the kind of place you should check out, you’ll be motivated by the fact admission is complimentary but you will want to take note that parking is $12. There are some helpful tips on the website too. St. Louis is known as the Gateway to the West because it was the primary place where Lewis and Clark started and ended their major expedition to discover and claim the western US. I talked about it a bit in the post that talks about The Arch. I have to admit that I hadn’t heard of gooey butter cake til I started coming to St. Louis so often. It’s a really sweet cake — in fact a website that offers up the Gooey Butter 101 says it was created when someone put too much sugar in a recipe. You can find it on the menu at lots of local restaurants and most bakeries — including the ones at local grocery stores — offer a gooey butter cake. This one is on my list of places to go thanks to Danielle! It seems like Gus’ Pretzels is a South City tradition. The A to Z series about St. Louis is supposed to wrap up in April. Feel free to suggest topics for the upcoming letters or call me out for missing a critical piece on today’s post. You can see what else in St. Louis gets a shoutout in the A to Z or check out last year’s post for A in my A to Z of Agriculture. It was a post I wrote based on a reader’s suggestion and it became the most popular one in the series — G is for GMOs which talked about why farmers would plant them, etc. And you can browse a list of almost 2,000 bloggers doing their own A to Z Challenge.